What is a feeding assay? A feeding assay is a laboratory experiment used to quantitatively measure feeding trends of organisms in the marsh. How can we set up a feeding assay experiment? Local Ulva found in the mudflat near the Sotka Lab. Sotka scientist, Alyssa Demko has been doing research with feeding assays to see if herbivores prefer to eat one type of seaweed over the other. Alyssa Demko has been running choice feeding assays. This means that each animal has two food choices. 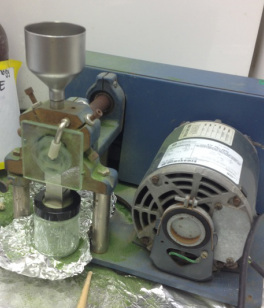 For every feeding assay experiment, there is a control and the sample being tested. The control for this experiment is local Ulva species found in the marsh outside the Sotka Lab. 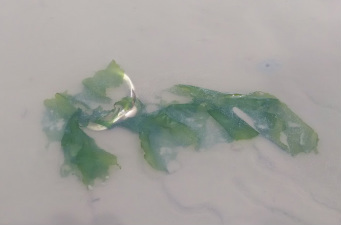 Ulva was chosen as the control because it is local, and herbivores like to eat this type of seaweed. For each feeding assay each animal will have two choices: local Ulva or a different seaweed. Alyssa is testing over 30 different kinds of seaweeds that live in polar regions all the way to tropical regions! One choice feeding assay will have 30 to 40 of each animal. For example, in a choice feeding assay of Ulva versus Gracilaria, there will be 30 crabs, 30 urchins, and 30 amphipods all having a choice of eating either of these seaweeds. The animals will have the opportunity to eat for roughly 24hours. Alyssa will check the progress on the seaweed window screens every few hours. Once more than 50% of either seaweed sample has been consumed by an animal, the window screen will be removed. The samples are removed at this point to get a better indication of which seaweed an animal actually prefers. If a crab eats only one type of seaweed and runs out of that food source, it will most likely start eating the second choice only because that is all it has left. Alyssa has been trying to answer the question, "How is palatability of seaweeds influenced by the latitude of the seaweeds and the phylogeny of the seaweeds." Her hypothesis is: Palatability of seaweed will increase with latitude. 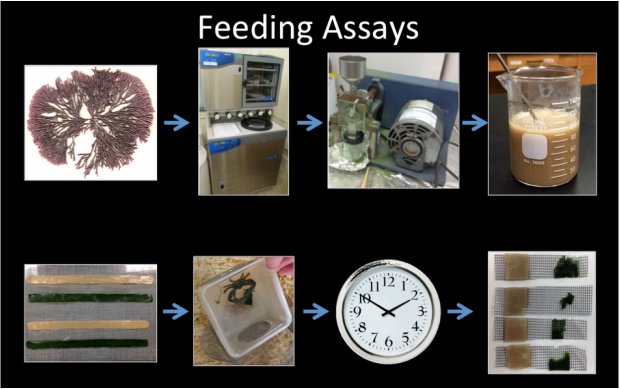 For each feeding assay, Alyssa will count the number of squares consumed for each type of seaweed. The results will be compared to see if animals prefer to eat one type of seaweed over the other. Alyssa found a strong relationship between the latitude seaweeds are found in and how appealing they are to eat. Seaweeds from polar and temperate locations were twice as palatable as were seaweeds from the tropical location. These latitudinal increase in palatability is largely explained by how the urchins responded to Rhodophytes (red seaweed). 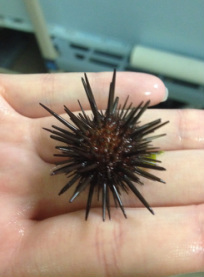 For example, urchins showed that they loved polar red seaweeds versus tropical red seaweeds. The palatability of Phaeophytes (brown seaweed) did not significantly differ across latitudes (polar, temperate, tropical). Conclusions: Polar seaweeds are much more rich in protein and rich in nitrogen, which is very appealing to herbivores. So overall if given the option, herbivores will choose polar seaweeds versus the tropical ones.